and one down for the hell bound. our front door back in Canada. exhausted from delight. Isn't that wonderful? sweaters before we head out. less and less time at the show. This weekend will be different. Labels: Florence. 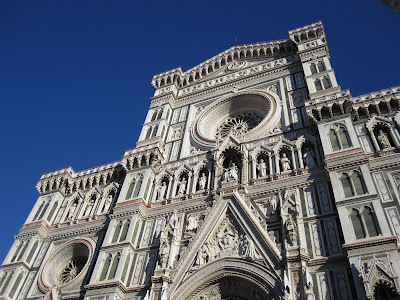 The Duomo. 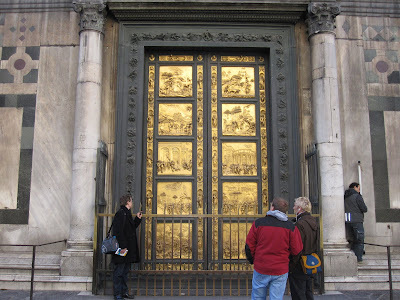 Ghiberti's doors. How wonderful to be in Florence, Italy!! I am sure you are enjoying the heck out of it! Sorry for the long span between hearing from me...I must be something of recluse and don't know it! Congrats on the show...who could deserve it more...go girl! Anyway...wonderful blogging as always and hope you are getting the chance to paint while there! You had me LMAO about the door! I remember studying this masterpiece in art history and thought then how marvelous it would be to see it. Now, you and Steven have and it seems more real. We didn't get to comment yesterday. Each day is so filled with things to do! The climate is 100% intellectual...something this shallow Canadian finds a real treat. Thank you so much for your lovely compliments. Thanks. 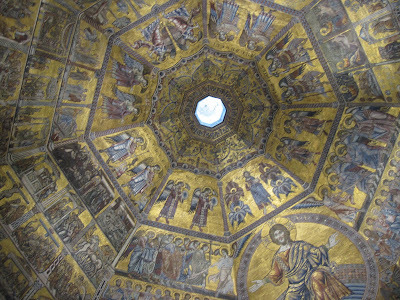 You need to come to Florence. It is really beyond description. You would just love it here. everything is art all the time, with intense discussions about the meaning of what you're seeing and what you're making at every turn. And the food. Oh God. Luckily we walk miles every day. Over ancient cobblestone. Very good exercise. So wonderful to hear from you. No I'm not painting. I don't have paint with me, and I'd say that's the only thing I miss. The picture of the doors in my art history book was in black and white, and the doors were very dark black. But they have since been cleaned and restored. There is restoratin going on all over the city. The Duomo is partially covered with scaffolding, and you can see the difference on the clean side. White and green marble make patterns. There is so much to tell you that it's a good thing I do the blog every day or I'd forget. overhead projector. But she managed to inspire me anyway despite my 14 year old fascination with boys.